RUVIVAL partners with Global Water Dances and you can be part of the global dance event! Apply until the 31th of March here. Global Water Dances aims to use the international languages of dance and film to raise awareness on issues related to water. The project promotes awareness and a behavioural shift toward solutions for water preservation and conservation through community engagement. 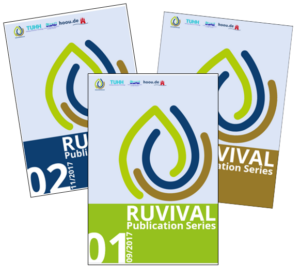 Water is one of the central topics in our RUVIVAL Toolbox and a part in each of the Lectures. However, now you can be part of an international movement to raise awareness on water issues. Therefore, join one of the events as a dancer, choreographer, film maker or organiser. Already ample dance groups have registered for the event and you can make the next dot on the site map by organising an event in your area (worldmap of registered sites). If you are a dance group from the African continent, there are special funding opportunities possible, just register and you will be contacted. ⟵RUVIVAL Toolbox now available in Spanish!